This fat is really embarrassing! The underarm fat that hangs all around under your arm and extends till your back giving it a real sagging look! How many times have you changed your idea to wear that nice strappy tank top just because you do not like all this underarm fat to show up underneath your arm hanging like a spoilsport! So, is there any magical remedy to lose underarm fat! I am afraid, there’s not. You need to try and lose your overall body fat to wholly get rid of underarm fat. However, you can at least build your muscles in the area surrounding your underarm so that this fat would not hang loosely but will look tightened! So, you need to exercise and also control your diet to lose fat. There are certain exercises that may help you a lot to tone up your underarm muscles to help keep underarm fat from becoming unsightly! 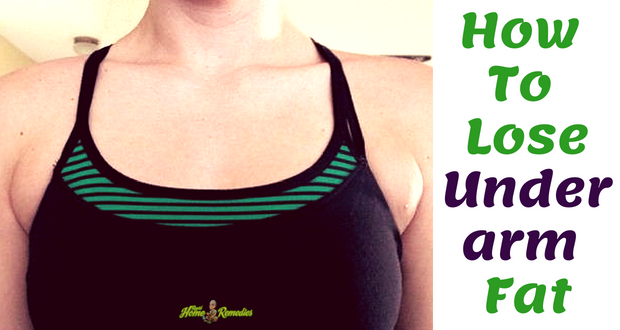 We will discuss three points in this article about how to reduce underarm fat. These include exercises to tone up the muscles around underarms, tips to lose overall body fat and diet that will help you lose fat from the whole body including underarms! Toning underarm fat basically means that you have to tone your upper arm muscles namely the biceps and the triceps. The biceps (biceps brachii) is the two-headed muscle lying on your upper arm between your shoulder and the elbow. It is needed to bend your arms. The other one, triceps (triceps brachii muscle) is the three-headed large muscle lying on the back of your upper arm. It is needed for extending the elbow joint as when you straighten your arm. You need to do strength training for biceps and triceps if you want to tone up that underarm flab and wear the hot strappy tank top to look all gorgeous without any guilt! Here are top exercises to tone your underarm fat and how to do them. Stand straight. Keep your feet at the same width as of your shoulders. Take the dumbbells in both of your hands. Your hands should be in front of your hips and your palms should be facing out. Now bend one of your arms so that it comes parallel to the floor. In other words, bend it at 90 degrees. While letting your this arm remain parallel to the floor, curl your other hand upwards, towards your shoulder. Bring the arm back to where it was. Remember to keep the other hand at 90 degrees position. Repeat this arm’s biceps curl for about 8-12 times. Now, switch the roles of the two hands. The one that was resting parallel to the floor will now curl towards shoulder and the other one will remain parallel to the floor at 90 degrees. After doing curls for 8-12 times with this arm, use both the hands to curl towards your shoulders at the same time. Repeat this too for 8-12 times. Perform such 8-12 repetitions in 2-3 sets. Take the dumbbells in your hands and stand straight with legs at shoulder’s width. Extend your hands over your head. While doing so, your palms holding dumbbells should face each other and the weights should also touch each other. The inner elbows should stay close to the sides of your head. Now lower the weights behind your head to let your forearm touch your biceps. Remember, upper arms will remain still while your forearms move behind. Bring back the hands extending over your head. Repeat 8-12 times. Do 2-3 sets. Sit on the bench or the chair. Keep your bottom close to the edge of the bench. Your feet should stay together and flat on the floor. Keep your hands on the bench on either side of your hips. While bending your elbows, lower yourself from the edge of your seat towards the floor till your elbows rest at a little less than 90 degrees. This will bring your elbows almost at the height of your shoulders. Straighten your arms, raising your body back to the beginning position. Repeat for 8-10 times. Do 2-3 sets of each repetition cycle. For a variation, you can stretch your legs forward in front of you when you lower your bottom to bring it down from the edge of the bench. Push-ups are one of the best exercises to lose underarm fat. Also, this exercise for underarm doesn’t need any equipment. Just your body and some lifts to give your arms some strength training! If needed, just take a mat to lie down on. In fact, that too is not essential, you can just lie down on the floor! Lie on your with your face down. Keep your elbows bent under your shoulders. Rest the forearms on the floor with palms down. Extend your legs in such a way that your feet stay at your hips’ width and the balls of your feet touch the floor. Keep your abdomen and lower back tight while you stress your forearms and shoulders to lift your hips to bring it in line with your heels. Hold your body in this position for about 5 seconds. Gradually increase the time of holding as you become comfortable. Do 2 sets of 10-15 repetitions. If you get a chance to hit the gym and access the lat pulldown machine, you can use it to lose your underarm flab. Wide grip pulldowns on lat pulldown machines tone your latissimus dorsi muscles, lying right behind your armpits. This helps you get rid of underarm fat too. Attach a straight bar to the lat pulldown machine. Now sit down on the seat of the machine and snug its padded support on your thighs. Hold the straight bar with a wide, overhand grip. Lean back a little but let your backstay straight. Now raise the bar back up slowly. Repeat this for 10 to 12 times. Arm circles tone your arms if done the right way. In fact, your shoulders and back too get toned along with your biceps and triceps when you do these arm circles. You may or may not use dumbbells for this. Stand straight with your feet at the width of your shoulder. Extend your arms to the sides and keep them straight. They need to be at shoulder height. While keeping your shoulders down, do circles backwards for 20 times. Now do 2o forward circles. If using dumbbells, stand the similar way as in step 1. Hold the dumbbells in your palms that should face down. Do smaller circles in a clockwise motion for half a minute. Now do the same in the anticlockwise motion for another half a minute. Always keep your back straight and your abdomen tight. If your backbends, take lighter dumbbells. Stand with your feet shoulder-width apart. Knees remain slightly bend. Holding the weights, stretch your arms straight overhead. Hold them there for just a second. Lower your hands and bring back to the original position, just above the shoulders. Do this rather slowly, take 3-4 seconds to bring the hands down. Stand to keep your knees bent and lean forward slightly. Hold the dumbbells in your hands. Keep the hands hanging forward in front of the bent knees. While holding them, bend your right elbow and bring the dumbbell to your side till your upper arm gets parallel to the floor. The left hand will remain in the original position. Take the dumbbell back while straightening your arm backwards. Rotate your arm while doing so in order to make your palm face the ceiling. Now rotate your arm back to make it face in and then return to the bent arm position. Switch arms. Do the same steps with the left arm. Do 10-12 repetitions with each arm. This exercise works on your back and also on armpit flab. Extend your arms sidewards at shoulder level. Palms need to face down. Lift your arms, legs and chest off the floor. While holding the position, bring your arms forward past your head. Move the hands back to the original position. Lower your legs and chest, relax. Again repeat all the steps. Stand straight keeping your feet hip-width apart. Hold dumbbells in your hands and keep them down in front of your thighs. Palms should face towards yourself. While keeping your elbows slightly bent, raise your arms up in front of yourself until they become parallel to the floor. Now lower back the hands to starting position. Stand in the same position as in front shoulder raise. But keep your hands with dumbbells at your sides and palms should now face each other. Keeping your elbows slightly bent, raise your arms straight outwards to the sides till they become parallel to the floor. Bring the hands back to their original position. This exercise not only strengthens your arms and reduces fat there but also work on your back. Ensure you do this exercise where you have a lot of space to move around. Stand with your feet at hip-width. Touch your palms to the floor. You may bend your knees if needed. Now make your hands walk forward till the time you support all your weight on your hands and toes. Be in this position for about 8-10 seconds. Now make your feet walk forward and meet your hands. Your palms need to remain on the floor. You may bend your knees if needed. Repeat the procedure again by first walking the hands and then the feet. Repeat for at least 4-5 times or till you reach the wall. Now turn around and repeat the inchworm walk with hands and feet in the opposite direction. This exercise is actually adapted from a Yoga posture known as Urdhva Mukha Savasana. It not only tones your shoulders, torso, arms and wrists but also your legs and buttocks. Lie flat on your stomach, face down. Keep the hands at the sides, close to your body. Now bend the arms and bring your palms close to your chest. Palms will rest on the floor by the chest. While straightening your arms, lift your upper body to your thighs. Your weight gets distributed between your hands and toes. This was all about building muscles and toning them to make your underarm area tightened. However, for really losing fat underarms, you need to lose overall body fat. Now let’s have some tips to lose overall body fat which is essential to get rid of underarms flab too. Burn more calories than you consume in a day. For this, do cardiovascular exercises and monitor your diet. You need to do exercise for at least 150 minutes in a week. This goal can be reached by exercising for 30 minutes for 5 days a week. You can do one or more such exercises as running, be jogging, brisk walking, climbing stairs, kickboxing, martial arts, swimming laps, high-impact dance etc. Certain cardio exercises tone your underarms and back at the same time. These exercises need stressing your upper body like swimming, basketball, kickboxing and dancing. However, cardio exercises need to be combined with strength training exercises to tone underarms and back. You can thus do such exercises as flying Superman, upward-facing dog and inchworms along with all the other exercises that have been incorporated in the first section of this article. Exercise whenever possible. For example, do jumping jacks or crunches when watching TV and when television commercials are on the screen. Yes, no exercise will prove effective if you keep on eating more calories than what you burn. That doesn’t mean you need to starve yourself. Just some little changes in your diet will give you a body that is in shape and flab-less underarms too! Cut back on eating out. If you eat in restaurants multiple times a week, bring that to only once a week or fortnight. Also order grilled and baked rather than fried and junk foods. Stop having processed foods, at least reduce them considerably. Chips, candies, cakes, biscuits etc. make you fat. Instead have fruits, dry fruits, and other healthier snacks. Never skip breakfast and eat small frequent meals during the day to avoid hunger pangs. Eat more vegetables. Start your meal with salads and see how you don’t have room left for fried foods and desserts. Cut back on sweets and sugary foods. Have a small amount of healthy fat with meals. These may include nuts, seeds, avocado olive oil, or coconut oil etc. Drink enough water to stay hydrated. Avoid having soda, energy drinks, coffee beverages, drinks containing added sugar and syrup. They all make you gain weight. Drink green tea as it boosts metabolism and helps burn fat. Have early dinner. Night time eating makes you fat that also gets deposited underarms. The key to lose underarm fat, thus, is to watch your movements and diet too! Exercise and monitor your diet and then see how you lose your weight and get a fit body without any underarm flab!